This explains the feel-good effect of acupuncture. When the needle is inserted, and then stimulated, it blocks the efferent neuron. This means that it is blocking the signal the injured/diseased site is sending to the brain saying “I’m hurt!”. This then allows the body to get rid of the inflammatory factors (histamines, leukotrienes) and allow the area to mobilise again, bringing in fresh blood, and moving on fluids from the swelling. So, the first stage of pain relief and healing is already beginning. The correctly manipulated acupuncture needle creates a neurochemical reaction in the body, which signals the second stage of healing. 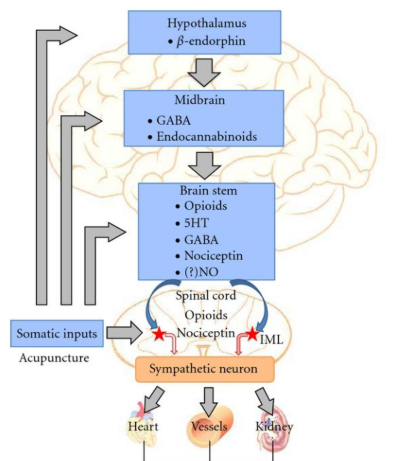 The stimulation of the needle causes the brain to release endorphins; endorphins are the feel-good hormones that are released from the brain, spinal cord, and other branches of the nervous system; these are the neurotransmitters (how nerve impulses are sent) that give you the outward feeling of happiness, and are really great at relieving pain. As the endorphins are stimulated other neurotransmitters are activated in other areas of the brain via the GABA pathway in the midbrain. The GABA pathway is a chemical messenger in the brain that has an important role in inhibiting other neurons actions, and modulating the release of dopamine, endocannabinoids, and serotonin that then enhances the feeling of relaxation whilst reducing your pain. While your system is awash with these feel good hormones, you will feel relaxed, this outward feeling of joy is then enhanced internally into a feeling of inner contentment: that real relaxed feeling you have when the session is over.